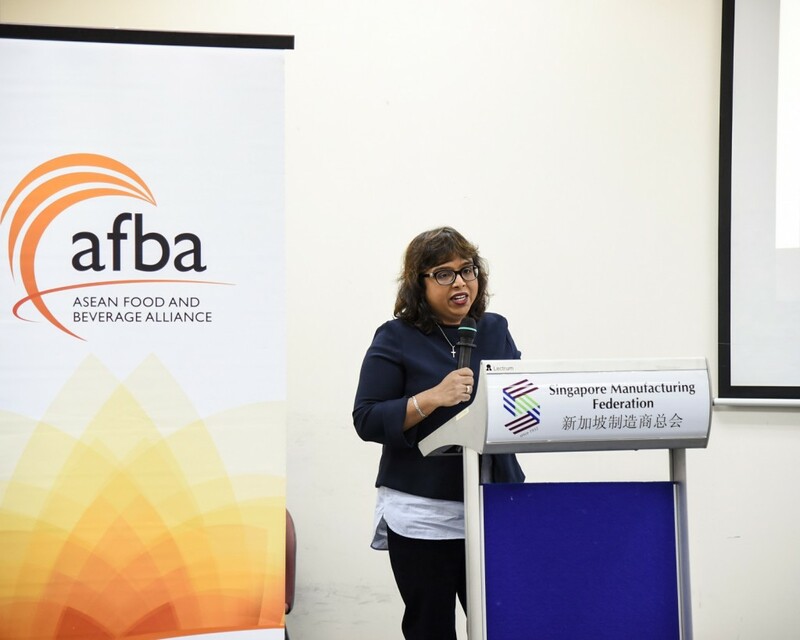 The launch of the “Nutrition Labelling on Prepackaged Food: Impact on Trade in ASEAN” report was held on 28 February 2018. 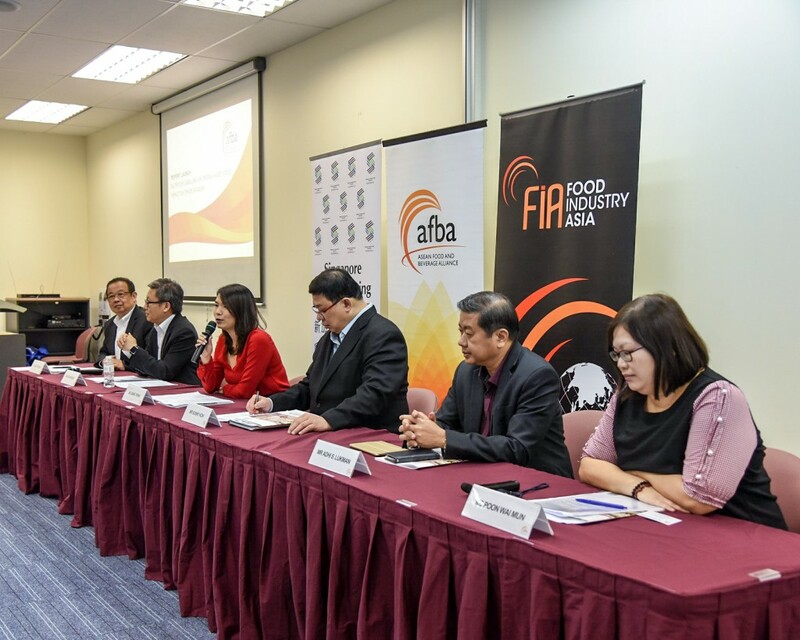 The report was initiated by the ASEAN Food and Beverage Alliance (AFBA) with the support of Food Industry Asia (FIA), and focused on trade barriers in the Association of Southeast Asian Nations (ASEAN) for the prepackaged food and beverage (PPF) sector brought on by nutrition labelling. Recommendations were made for the harmonisation of nutrition labelling standards, including the next steps toward a more inclusive discussion with ASEAN stakeholders, including regulators, policymakers and industry players. 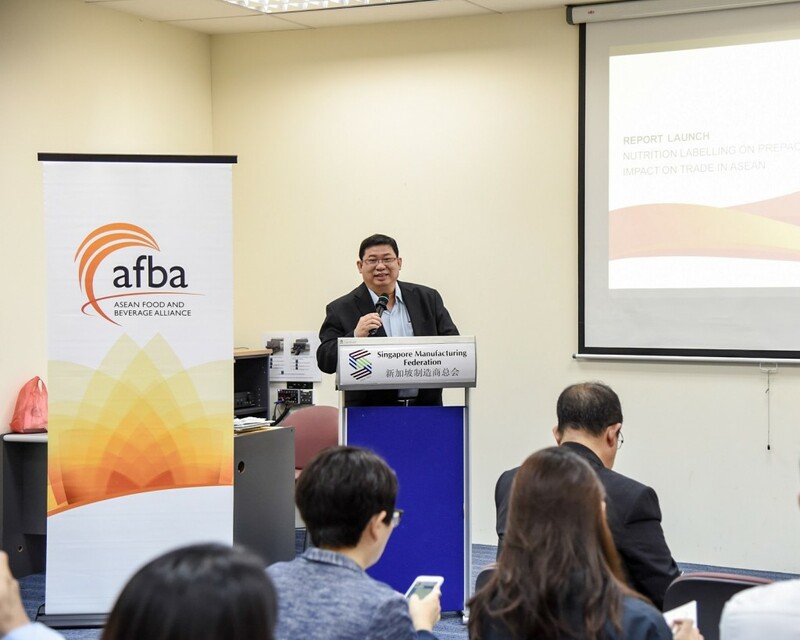 Mr Sunny Koh, President of AFBA and Deputy President of the Singapore Manufacturing Federation, delivered his welcome address at the report launch. In his welcome address, Mr Sunny Koh, President of AFBA and Deputy President of the Singapore Manufacturing Federation highlighted the vision of the ASEAN Economic Community (AEC) for greater economic integration in the region. As ASEAN progresses toward a single market, the highly regulated environment in the food industry presents challenges to industry members and nutrition labelling is one of the trade barriers faced by industry members, especially Small and Medium Enterprises (SMEs). In order to tap the market potential in ASEAN, it is important to address these trade barriers through close partnership between governments and the industry. In the report that was developed by Associate Professor Dr Evelyn S Devadason and Associate Professor Dr VGR Chandran Govindaraju from the University of Malaya, several key findings were observed from both micro and macro-level analyses. A comparison of regulations or guidelines related to nutrition labelling in the region showed variances, such as the nutrients to be declared and nutrient reference values. Besides, some countries maintained a voluntary approach whereas others required mandatory implementation. The Economic Research Institute for ASEAN and East Asia (ERIA) and the United Nations Conference on Trade and Development (UNCTAD) (ERIA-UNCTAD) database was utilised in the macro-level analysis during the study to understand non-tariff measures (NTMs) in the food sector, of which nutrition labelling is a subset. The NTMs recorded are based on official regulations in ASEAN Member States that are considered as mandatory and does not capture non-official guidelines. Therefore, the figures would need to be understood along with considerations of the existing voluntary guidelines that are not included. Dr Evelyn S Devadason, research consultant and report co-author, delivered the findings that were gathered from the study. As the industry advances, NTMs are inevitable and may not result in adverse effects. NTMs are policy measures that serve to ensure food safety, protection of human health, animals and plants, fight pests and diseases, as well as the protection of environment. The challenge arises when NTMs turn into NTBs, which is a subset of NTMs and arise from government measures such as trade permits, export permits, export taxes, import licenses and bans which create hindrances to cross-border trade and this, could be one of the factors resulting in low trade efficiency of PPF sector in the region. Therefore, there is a need to differentiate NTMs and NTBs. The nature of the challenges needs to be considered during the process of addressing the lack of harmonisation, and a procedural obstacle such as the manner of implementation, has to be addressed at a national level whereas obstacles that pertain to regulations ought to be discussed at a regional level. Codex guidelines were put forth as a comprehensive framework for nutrition labelling, as part of the recommendations. Beyond achieving consensus among ASEAN Member States to acknowledge the Codex international guidelines, effective implementation in the individual Member States is crucial to address regulatory incoherence. A panel discussion on “ASEAN Integration for the F&B Sector: Opportunities and Challenges” followed Dr Devadason’s presentation and gathered representatives from the AFBA Executive Board, national industry representatives from Indonesia, Malaysia, Singapore and Thailand, as well as the traditional medicine & health supplement sector to provide perspectives on the challenges on nutrition labelling, recommendations from the report, and insights on regionalisation for the food and beverage industry in ASEAN. The panel discussed the need to address nutrition labelling as a trade barrier and suggested that to move forward in the discussion on nutrition labelling harmonisation, industry members needed to play an important role to engage regulators through national industry associations and share the recommendations in the report. The panellists also raised the need to build up consumer education to ensure nutrition information is well understood. The importance of regionalisation for the food and beverage companies in ASEAN was emphasised although it was acknowledged that companies face hurdles in the process of accessing export markets due to fragmentations in regulatory framework. This is seen as more apparent for the SMEs due to limited resources and this impedes their competitiveness in regional trade. As ASEAN strives towards a single economic community, considerations must be made to the economic development of the respective Member States to cater to the needs of developing countries by providing the necessary assistance. Clearly, regulators and policymakers play a major role in the harmonisation process. At the same time, industry members have a shared responsibility to enable harmonisation to take place. Technical expertise that can be offered by industry members serves as vital resources and helps position industry members as key partners in bringing regional framework towards a more harmonised structure.